Thanksgiving prep is officially under way at our house, now that the Cranberry Relish has been made. Oh sure, come Thanksgiving Day, Basil will again argue the merits of the canned kind with its helpful portioning lines. 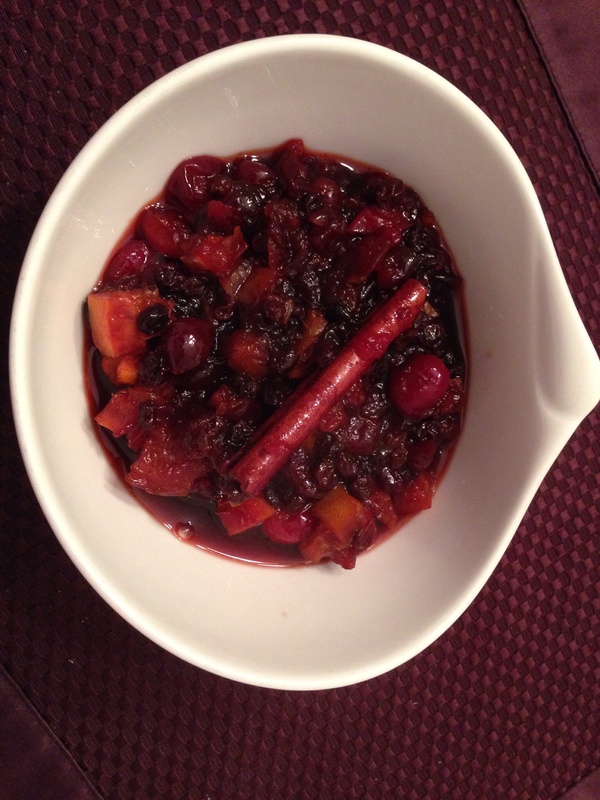 But homemade Cranberry Relish is king here. The ingredients ready for some heat. Mom started making it years ago and included the recipe in the cookbooks she created for me when I got married. It’s easy to make and after one taste, you won’t reach for the canned stuff again. This sweet-tart condiment is terrific with turkey, adds a bit of zing to a sandwich of leftovers or sitting atop a bit of brie, and would be delicious with a pork roast at Christmas. The recipe calls for nuts, but I omit those on account of Catherine’s nut allergy (and because, well, as family and friends already know, there are enough nuts in this house). In a medium saucepan, combine all ingredients. Bring to a boil. Reduce heat and simmer uncovered about 10 minutes, stirring occasionally. Cool. Spoon into jars with tight fitting lids. Store up to 1 month in refrigerator. Makes about 4 cups. Oooops! Sorry. That would be 3/4 CUP orange juice. 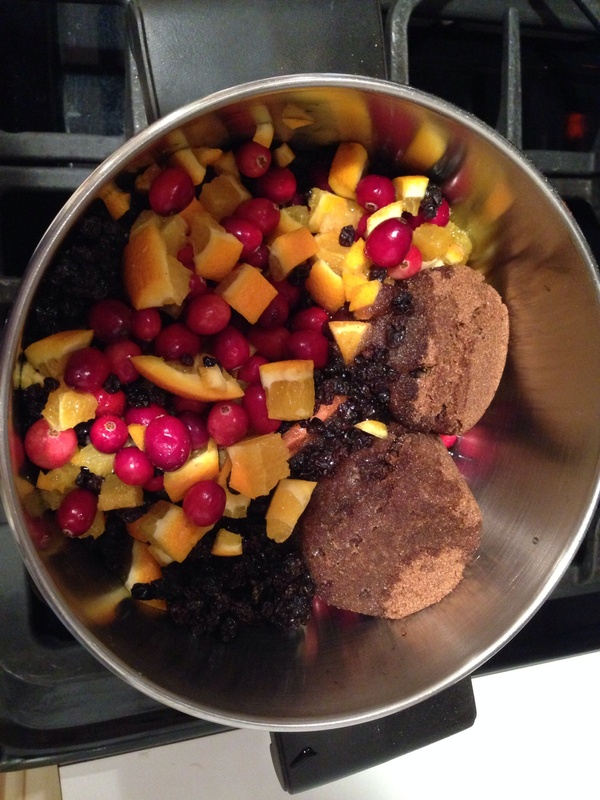 If some of your readers can’t eat cranberries (like Dad now) or plain just don’t like ’em, they may like this substitute I came up with…. 3/4 orange juice. 1 cup packed brown sugar. 1 cup raisins. 1 cinnamon stick. Cook all ingredients over low heat for 10-15 minutes. When completely cooled, add remaining frozen raspberries. Stir gently. Let sit maybe 20 minutes. Ready to eat or freeze into portions. Dad says he likes it as much as original. Me? I wouldn’t eat either if you paid me! Gimme canned cranberry sauce that even shows me where to slice any day! !